11-time X-Games medalist, Snocross champ and world record-holding snowmobile legend Levi LaVallee to participate in day-long events leading up to Boat-In Movie. LaVallee will sign autographs and promote summertime wake sports in partnership with Minnesota Inboard. Giving new definition to an old entertainment concept, local businesses in Grand Rapids plan to bring back drive-in movies with a fresh twist – a Boat-In Movie out on the lake. The second annual Boat-In Movie Night on Pokegama Lake will take place the evening of Saturday, July 29, coupled with a full day of family entertainment on the water. The event will feature a giant 40-foot inflatable movie screen set up on Tioga Beach near the north end of the lake. Organizers expect 150-200 boats to make up a family friendly flotilla just off Tioga Beach before sunset. Participating boaters will enjoy open air and open water seating for an evening of classic family entertainment – from the comfort of their speedboats, runabouts, pontoons and other watercraft. The film for 2017 will be the family-favorite comedy “The Great Outdoors” featuring Dan Aykroyd and John Candy. Also new this year, four local product vendors have agreed to donate 10 percent of onsite product sales to go directly to the Itasca County Aquatic Invasive Species program. Money raised that day will go specifically to helping prevent the spread of invasive species on Pokegama Lake. The contributing product vendors include Lake & Co., Lake Living, WakeMN and Thousand Lakes Sporting Goods. In addition, Zorbaz restaurant has pledged a specific contribution to the same fund. 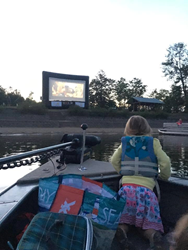 “The Boat-In Movie event was a huge draw for people last year, and this year we anticipate an even bigger turnout,” said Megan Christianson, executive director for Visit Grand Rapids. “Pokegama Lake is a perfect venue for this day-long celebration, with easy public launch access points, great amenities, open spaces for water sports and quiet nooks for fishing or relaxing. Capped off with a great movie about the great north woods, Boat-In Movie 2017 is shaping up to be a great day. For out-of-town visiting boaters, the best options for getting on Pokegama Lake include Tioga Boat Landing off Tioga Beach Road, King's Landing off Golf Course Road, and Southwood Boat Landing off Southwood Road.